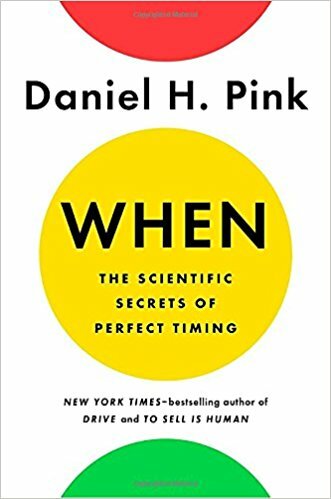 I recently finished reading Daniel Pink’s latest book, When; The Scientific Secrets of Perfect Timing. It is excellent. This may seem obvious (I, for example, am pretty much useless after 8 p.m.) but that doesn’t mean it is necessarily taken into account when making decisions or solving problems. 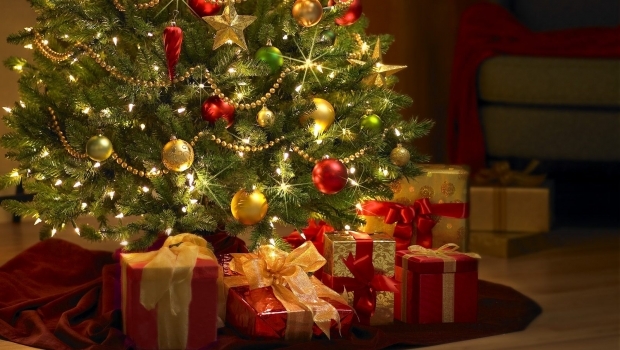 “The best time to perform a particular task,” Pink says, “depends on the nature of that task.” According to the research, for the majority of people, our sharp-minded analytic capacities – our ability to concentrate and our powers of deduction – peak in the late morning or around noon. An analytic problem doesn’t require any special creativity or acumen. Yes, it can be tricky but it has a single correct answer and you can reach that answer via logic. Whereas an insight problem is one in which reasoning in a methodical, algorithmic way won’t yield a correct answer. 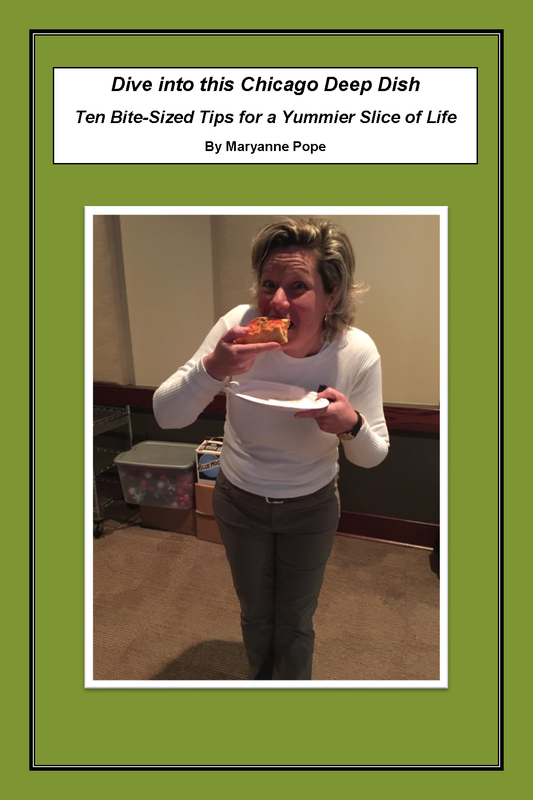 Rather, the answer will (eventually) come after a “flash of illuminance” – otherwise known as an aha! moment, which can help you see the facts in a new way…and then you will be more likely to solve the problem. For example, I am an early bird (or “lark”). I have the most energy and get my best work done early in the morning – but don’t expect much out of me in the evening (unless I’ve had a nap). Pink’s book resonated with me because it makes sense. I figured out a long time ago that I did my best writing in the early mornings. The trick has been for me to learn how to stay clear of looking at e-mails or social media until after I have finished my writing for the day. In the first part of the morning, I am better able to avoid allowing myself to become distracted. I have learned, time and again, that once I have “just taken a peek at e-mail,” I am sucked into the vortex…and my writing – my intense-focus work – for the day is done. So for me, I wait until later in the morning or early afternoon to tend to my e-mail. Whereas mid to late afternoon has always been down-time for my brain. I’m not alone. This is the time of day that Pink calls a “trough.” In fact, most people are not at their sharpest mid-afternoon. Yet they plow on through – often because their work requires them to. I fade out big-time in the mid to late afternoon and try to either have a nap, do appointments or errands, go for a walk or do a work task that requires less brain-power such as filing, dishes, folding laundry, etc. 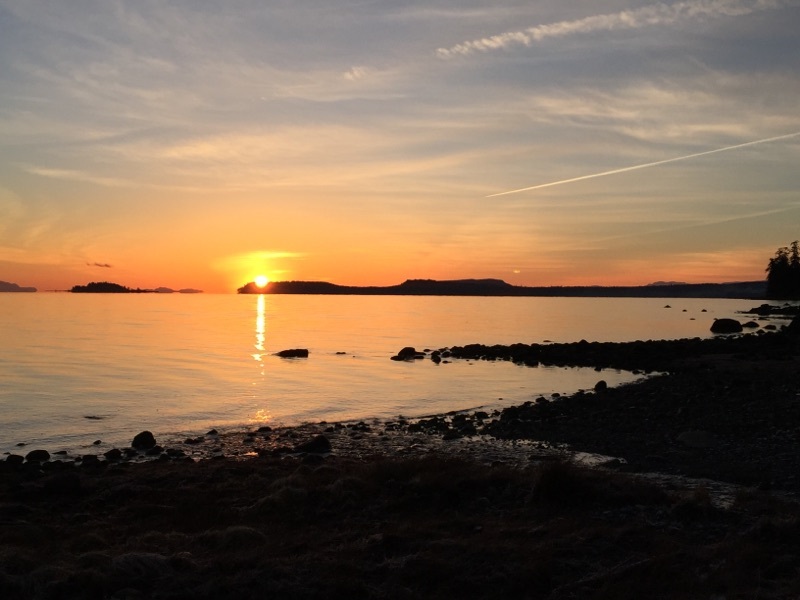 But for me, it is often during this mental down-time that the greatest insights come – often pertaining to the writing project I was working on in the early morning. If so, then I just jot down a quick note, then incorporate it into the project when I am sharp and focused again the next morning. If you’re interested in learning more about how the time of day impacts how your brain works, I highly recommend When; The Scientific Secrets of Perfect Timing. 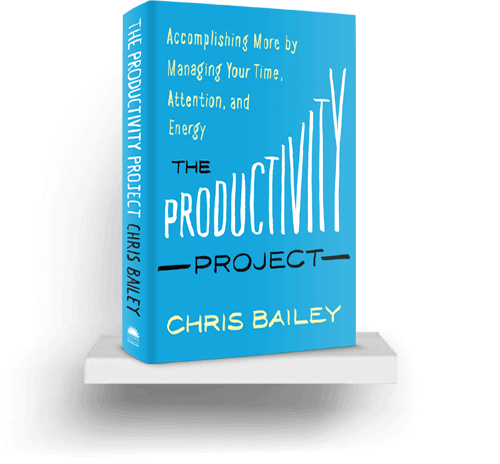 Along similar lines is Chris Bailey’s brilliant book, The Productivity Project; Accomplishing More by Managing Your Time, Attention and Energy. I love learning about how to make better use of my day so that I can get done what needs to get done, in as little time as possible. As I get older, I want to be spending less time in front of the computer, not more. I never know what to say this. Yes, it’s true: I am blessed to be able to work when I work best – and I take full advantage of that. But I suspect there may often be some room for tweaking one’s work schedule to better suit one’s energy levels. Individuals working at their highest productivity leads to more productive organizations…and safer, healthier and happier ones, too. 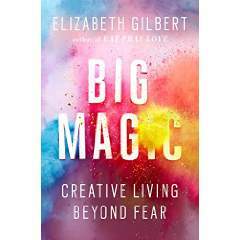 When I was looking for a suitable introductory quote for this blog, I came across the above saying – about our lives being our message to the world – and it stopped me in my cyber-tracks. It was just the reminder I needed that it’s who we are, and how we live our lives, that speaks far louder than our words ever will. This rings particularly true in the wake of the US presidential race and election. 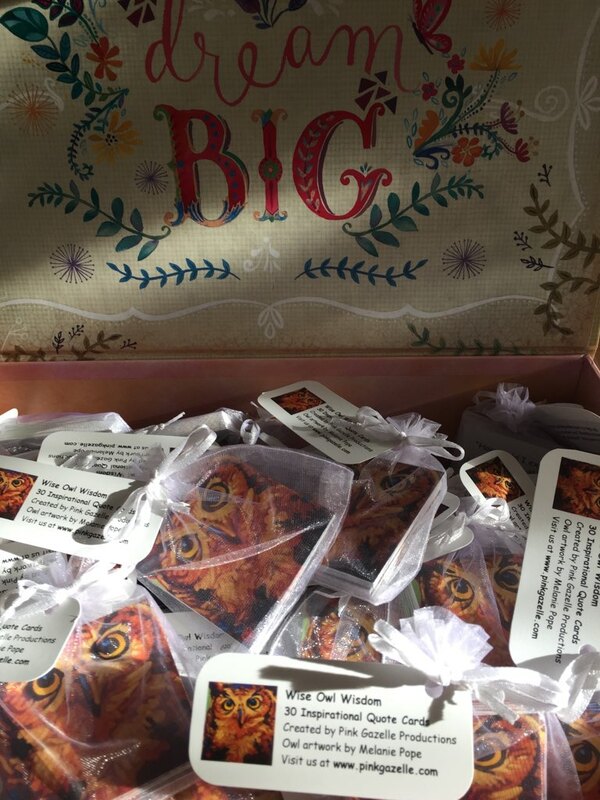 The owl artwork on this sweet little set of 30 inspirational quote cards was created by my niece, Melanie Pope. 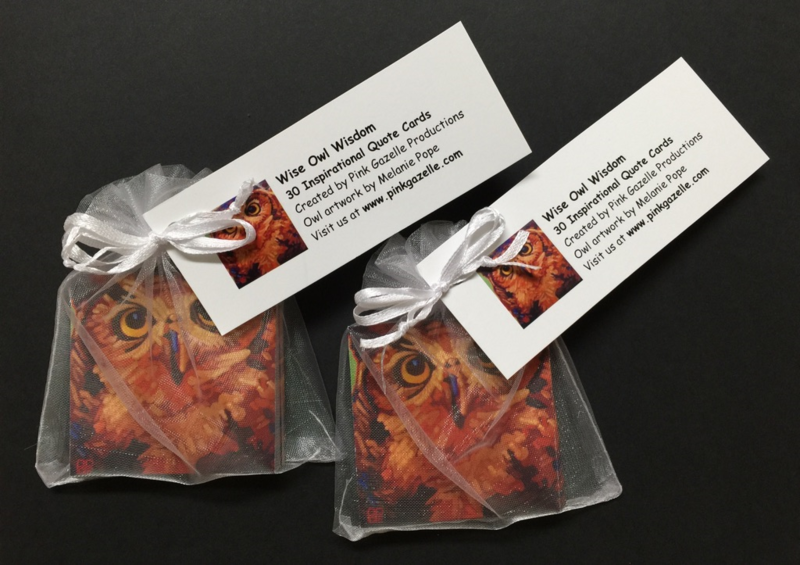 She is a painter and had made a print of her original owl painting – and when I saw it, I knew I’d found the perfect image for the cover of the quote cards. Each card is 2 inches x 2 inches. 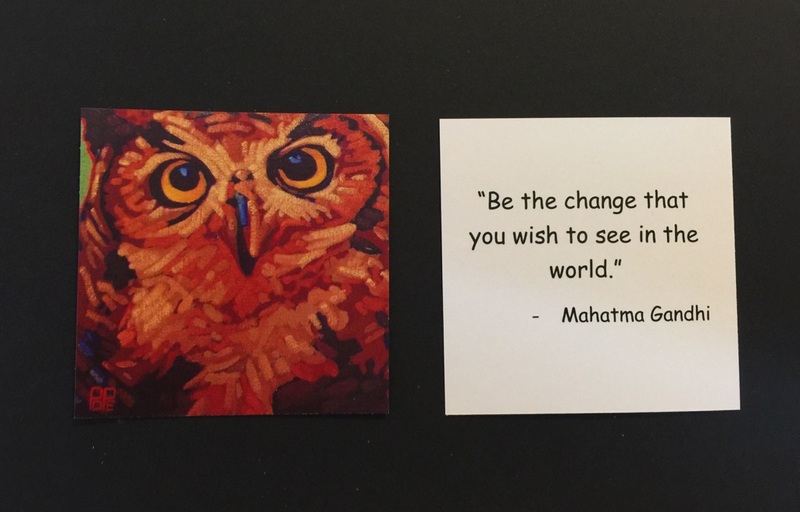 The owl is on the front of each card and then on the back of each is a different quote. 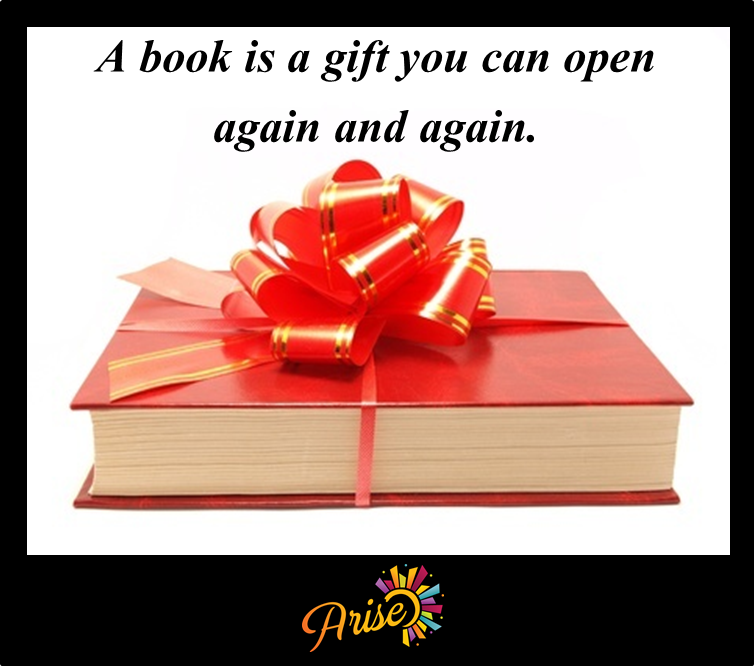 They can be placed face down in a small dish on a coffee table and then with your morning coffee or tea, you can pick up a card and see if resonates with you. If not, pick up another! 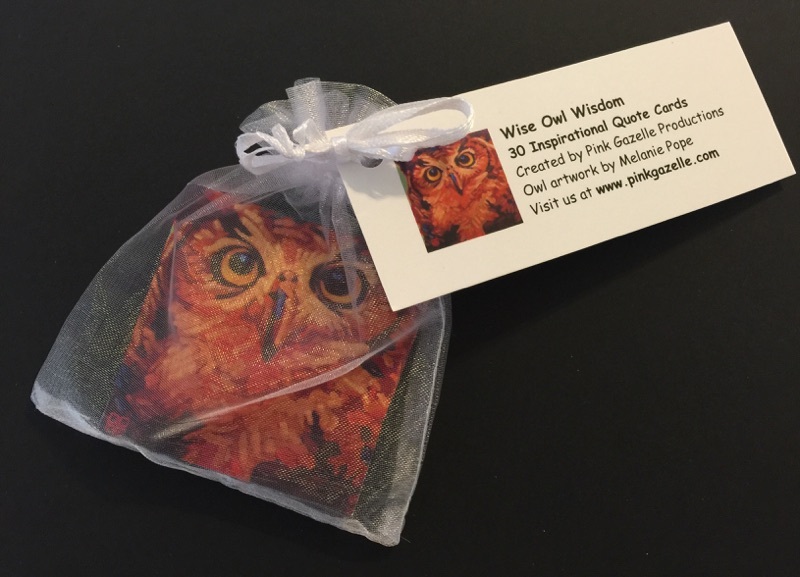 The Wise Owl Wisdom Inspirational Quote Cards are now available for purchase in the Pink Gazelle on-line store. They are $7.95 for one set or $14.95 for two sets. Please note, shipping is now FREE on all Pink Gazelle products.